Editor's Note: Every day this week, in honor of Veterans Day, Page 2 will feature a story by or about a prominent athlete who also served in the United States armed forces. 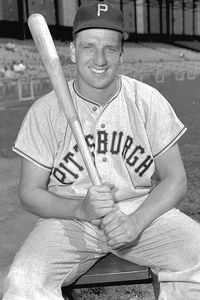 Ralph Kiner was one of the great power hitters of his time, leading the National League in home runs in each of his first seven seasons. He was also one of the many brave men of his generation who put his career on hold to serve his country during World War II. Even though he missed several seasons because of the war, he was inducted into the Baseball Hall of Fame in 1975. Below, he shares a few thoughts about his experience in the service. Kidwiler Collection/Diamond Images/Getty Images Ralph Kiner took the National League by storm after joining the Pirates in 1946. On Sunday, Dec. 7, 1941, I was a 19-year-old playing in a semipro game in Pasadena, Calif., not far from where I grew up. It was a game just like any other, until we heard the shocking news that the Japanese had bombed Pearl Harbor. Upon hearing about the attack, we all immediately said the same thing: You can't do that to this country! The next day, instead of playing baseball, I went and enlisted in the United States Navy. It happened that fast. I wasn't required to report right away, so I spent the first half of 1942 playing for Toronto in the International League. But then in June, I was called to report for duty. I was to begin training in the Naval aviation program immediately. Almost all of my fellow ballplayers who enlisted had signed up for the Army, but something about the challenges of becoming a pilot really intrigued me. The program was extensive and difficult. We were required to challenge both our minds and our bodies, as the curriculum required just as much studying as physical training. We had to study for months before we were allowed anywhere near an airplane. And when we finally did get to fly, we mainly just learned how to get the plane up and down without crashing. It was a heck of a primary objective. From there, we had to do more studying before we could really learn to fly. I was sent to St. Mary's, a college in California that was a national football power under the great coach Slip Madigan. But during World War II, the college was taken over by the Navy as a place to train pilots. We did a lot of mechanical and flight study there, and I met a few other ballplayers who were also stationed at St. Mary's. Baseball legend and future Hall of Famer Charlie Gehringer was one of my instructors, and Dodgers great Cookie Lavagetto used to be in charge of passing out equipment. We didn't play much baseball, though. In fact, in the two-and-a-half years I served, I played in only 12 games. Notable: Was part of the original broadcast team for the New York Mets, and still appears on telecasts today. However, that's not to say baseball wasn't being played in the military. In fact, after St. Mary's, I was sent to Corpus Christi, Texas, where I was commissioned and got my wings. While I was there, I happened to be in the stands to watch a game that lasted 17 innings. Another ball-playing pilot was on the field that day, by the name of Ted Williams. I, of course, knew who he was, because he had been in the majors already before he began his service. So imagine my surprise to watch one of the greatest hitters of all time go 0-for-7. I doubt he went 0-for-7 again in his life. Though I rarely got on the field myself, I wasn't jealous of those who did. Everyone who volunteered for the service possessed a singular focus on saving this country. I never felt like I was missing out on anything because I was doing exactly what I was supposed to be doing. For all of us ballplayers in the service, our duty to our country was always more important than playing baseball. Down in Corpus Christi, I learned how to fly bigger planes, including multiengined seaplanes we used to patrol for submarines. Once I got the hang of it, I was sent to Hawaii. There, I was among a group of Navy pilots charged with patrolling the South Pacific, looking for enemy subs and ships in an effort to keep our country secure. That's how I spent the rest of my active duty until the war was over. I've been asked if my time flying planes sharpened my batting eye. I'd say no, as that's a skill you either have or you don't. But I did miss out on a lot of experience. At the major league level, you learn by playing in games, not by practicing, and I missed out on an opportunity to learn a lot of things. But luckily, I was young enough to handle my time in the service and then come right back and play. I always get a kick out of young guys these days missing a small amount of time and then talking about having to get back in shape. When you are young, you can get back in shape in a week, tops! 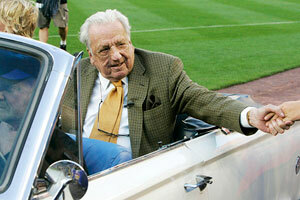 AP Photo/Frank Franklin II The Mets honored Kiner with Ralph Kiner Night in 2007. What I really took from my time in the military onto the diamond was a newfound level of maturity. You grow up fast when you are in a war. You learn a certain level of discipline that can serve you well playing baseball. You learn how not to make mistakes, as mistakes in the service can be very dangerous. You also learn to be subservient to your superiors. That probably helped me later on with a manager or two. While many, many ballplayers spent time in the service, I didn't talk that often with other players about our time in the military. We didn't really think about our absence from the game -- that's just the way it was. Once the war was over, we were lucky to be back doing what we had planned and hoped to be doing our whole lives. And we never forgot that not everyone was lucky enough to come back. So let's keep those who have served in mind as we celebrate Veterans Day. If it weren't for the veterans who fought these wars, the United States would not be here today. That includes the current troops, who are to be admired. I would like to say to them that those of us who served understand what you are going through and the sacrifices you have to make. But try to remember that service is a great experience, as you learn in a hurry what life is all about. Finally, let's take a moment to remember those who gave their lives in service for their country. As the great Bob Feller, who served well for more than four years during the war, once told me, "The real heroes aren't the ones who lived; it's the ones that died." Toby Mergler is a freelance writer based in Washington, D.C., who has written for MLB.com, Fanball and the Virginia Law Weekly. He can be reached at tobymergler@gmail.com. ESPN commemorates Veterans Day and ESPN's weeklong series "American Heroes: A Salute to Our Veterans."